You know and love the slightly slouchy fit and perfectly worn-in feel of boyfriend jeans—well, now it’s time to meet the boyfriend jean jacket! The oversized, lightweight layer offers a fresh spin on an old summer classic, and it can be paired with almost anything, making it a must-have piece. 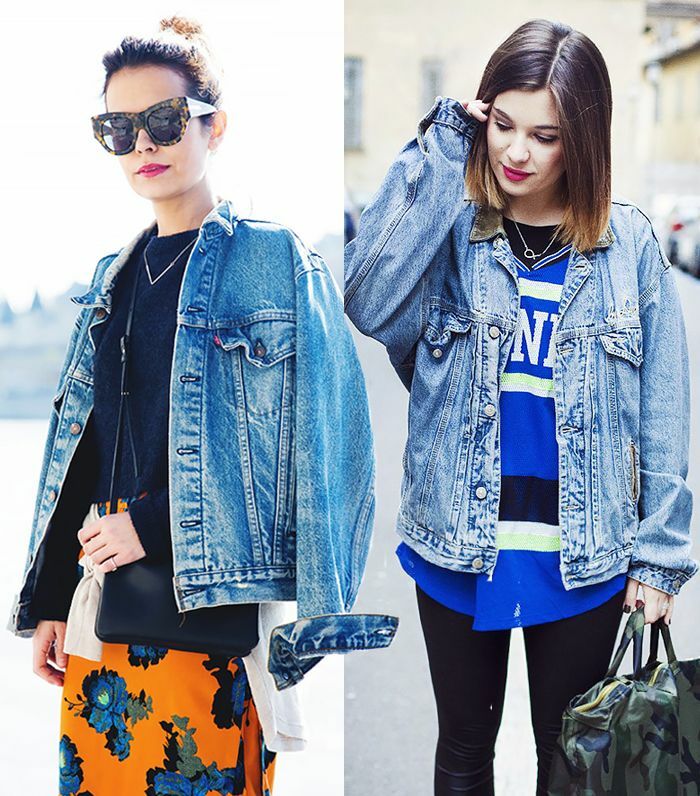 ?Scroll below to get inspired by the way some of our favourite bloggers are wearing oversized denim jackets, and to shop the trend too! A vibrant floral skirt and sophisticated pumps are the perfect companions to an oversized denim jacket. ?On Sara Escudero of Collage Vintage: Topshop skirt; Karen Walker The Number One Sunglasses ($250). Denim jacket + cut-off shorts + black accents = one awesome outfit. Try a long denim jacket with shrunken sleeves for a unique take on the oversized trend. ?On Shea Marie of Peace Love Shea: Joe’s Jeans Vintage Reserve Dress Jacket ($165); A.L.C. shirt; J Brand jeans; Barbara Bui Denim Printed Leather Oxfords ($560); Alexander Wang Pelican Sling Bag ($529); Celine sunglasses; Isabel Marant Uston Leather Carpet Belt ($140); Ben Amun bracelet. We love the playful touch that too-long sleeves add to this stylish outfit. ?On Irina Lakicevic of A Portable Package: Acne Studios denim jacket; Isabel Marant Etoile skirt; Altuzarra Mules ($449) in Black; Dries Van Noten vintage backpack. Scrunch up the sleeves of your boyfriend jacket and pair it with professional pieces to achieve ultimate cool girl status. Create a balanced look by wearing a crop top under your jacket. ?On Victoria Törnegren of Victoria Törnegren: ASOS denim jacket; Topshop top; Choies pants; Zara shoes. You can get away with wearing your fancy pieces for daytime. Simply top them with a denim jacket! On Maja Wyh of Maja Wyh: Diesel jacket; Fruit Of The Loom shirt; Isabel Marant For H&M skirt; Zara shoes. A boyfriend jean jacket in the perfect shade of blue goes flawlessly with an otherwise all-white ensemble. ?On Danielle Bernstein of We Wore What: Zara Oversize Denim Jacket ($70); Pixie Market White Eyelet Top ($109); Rag & Bone/JEAN The Repair Capri Jeans ($187) in Bright White; Modern Vice White Croco Emboss Slide Loafers ($275). Mix a distressed jean jacket with a sweet mini dress for outfit perfection. 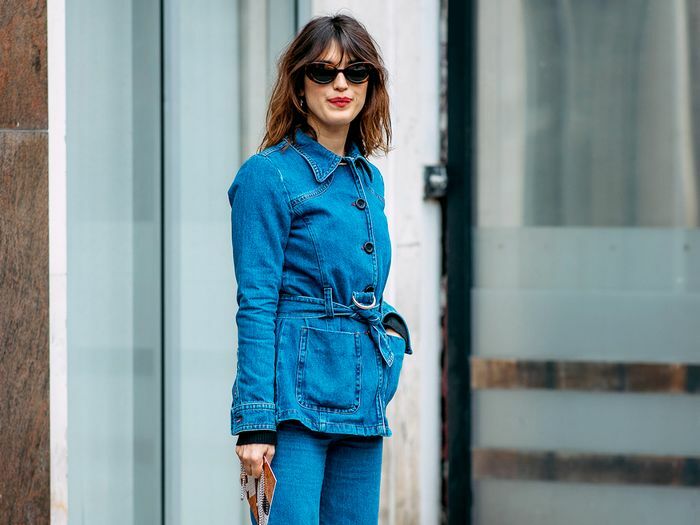 A denim jacket brings a gauzy maxi dress down to earth. Drape a boyfriend jean jacket over your shoulders fashion-editor-style for a poised look. ?On Kelly Framel: Rebecca Minkoff jacket and skirt; Aquazzura sandals. Who says you can’t layer in the summer? An oversized denim jacket over a chunky knit dress—yes please! ?On Elle Ferguson of They All Hate Us: Vintage denim jacket; Staple The Label dress; Dylan Kain bag. 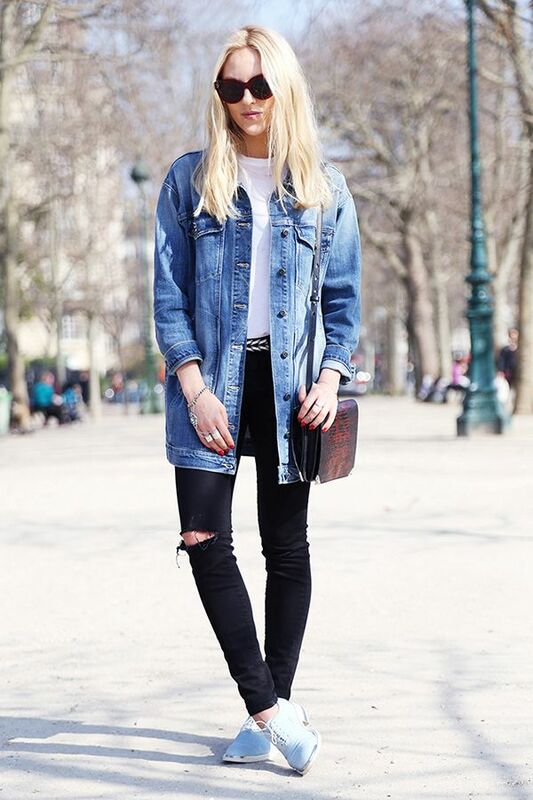 How do you style your oversized denim jacket? Let us know in the comments below!